Can someone please walk me through installing Allegro 5 or guide me in a direction to go to who can show me how to install it? I did a little googling, researching on how to configure my security settings, so I believe I was allowed to copy over the lib, bin, and include folders over into vc: lib, bin, and include folders. But, now I am struggling with copying over the bin folder into my sysWOW64 in 7:29 of the video. I cannot seem to solve the access denied message for the life of me. I am using a Windows 10 64 bit operating system along with visual studio 2015. And to solve my Allegro 5 installation problems, I have referenced the video https://www.youtube.com/watch?v=IZ2krJ8Ls2A to install allegro5. I really want to start game programming. But the biggest challenge is: by- passing my computers security to grant me access to install the Allegro 5 bin items into my sysWOW64 folder. First thing first, I will be using the Unstable branch, 5.1, since it is the one that has the new binaries. And Second, I will be using Visual Studio 2013 but it should be exactly the same for Visual Studio 2015 (Step 1 below has the only difference in the process you might encounter). We will download Allegro 5 direct from the Gna! repository. Here you select the file depending on what you have and what you want to do. This directory has 4 files, in my case, I will download allegro-msvc2013-x86-5.1.12.zip and you will download allegro-msvc2015-x86-5.1.12.zip. Select the x64 version only if you know what you are doing. It is important you remember where you extracted the files as setting the environment correctly depends on its ability to locate this path. At the top, where it says something like Configuration: Active(Debug), select All Configurations. On the left menu select C/C++ -> General. On this configuration page, select Additional Include Directories and edit it to containC:\allegro\include\ in its text field. On the left menu select Linker -> General. On this configuration page, select Additional Library Directories and edit it to contain C:\allegro\lib\ in its text field. Click on Apply at the bottom, but don´t close the window yet. Back at the top, select the Debug configuration. On the left menu select Linker -> Input. On this configuration page, select Additional Dependencies and edit it to contain allegro_monolith-debug.lib in its text field. Back at the top, select the Release configuration. On the left menu select Linker -> Input. On this configuration page, select Additional Dependencies and edit it to contain allegro_monolith.lib in its text field. (Optional)On the left menu select Linker -> System. 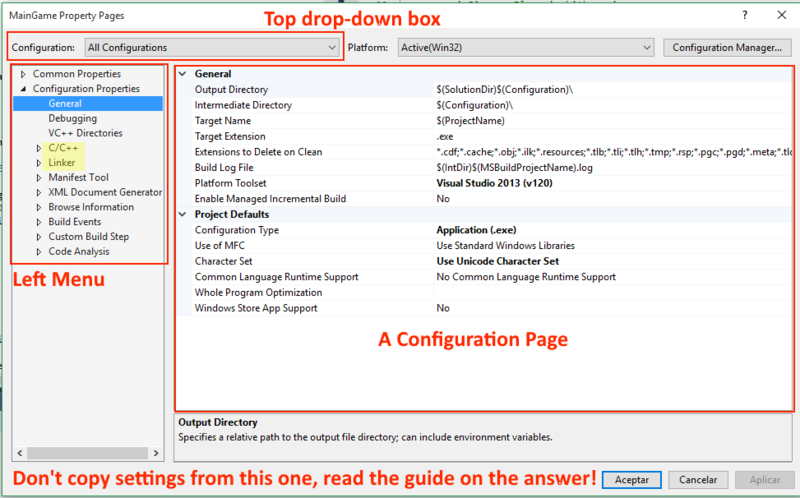 On this configuration page, select SubSystem and change it to Windows from the drop-down box. This will prevent the Terminal window to appear on Release versions of your program. Click on Apply then OK, this will close the Property Pages of the project and should prepare it for Allegro. If after compiling and running you get a blank window that closes in 5 seconds then Allegro is ready! If not, post your error message and I'll take a look at what happened. The solution is to copy on the Debug folder on the root of your project the allegro_monolith-debug-5.1.dll file, so that it is located beside your program's .exe file. Similarly, on the Release folder you have to copy allegro_monolith-5.1.dll beside that folder's executable. Both of this files should be on the allegro\bin\ directory of the downloaded archive. Keep in mind that you would probably need another dll from the ones I said, but it should also be included on the file you downloaded from Gna!. Not the answer you're looking for? Browse other questions tagged installation allegro5 or ask your own question.